Home » Case Studies » How to Protect Car Dealerships from Flood? How to Protect Car Dealerships from Flood? 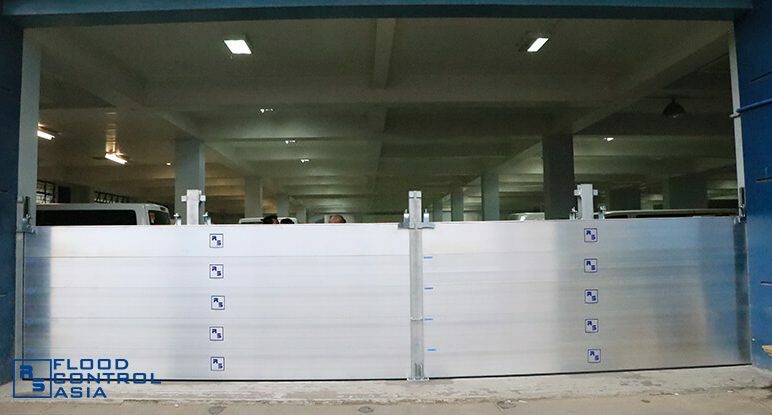 Royce Motor Center, Inc., a car dealership in Cabanatuan, Nueva Ecija, Philippines, gets total flood protection via RS Demountable Barriers. Though all business establishments are at risk when flooding strikes, car dealerships are probably one of those that sustain the heaviest damages. Cars that worth hundreds of thousands – or even millions – can be covered with muck and dirt in an instant. 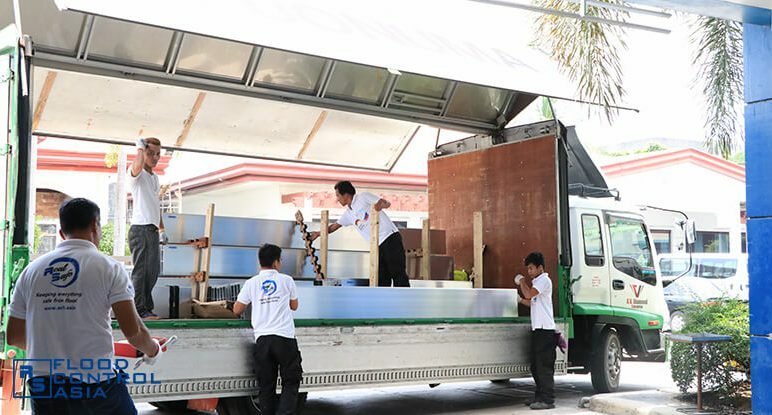 Such is the burden that Royce Motor, a Nissan car dealership in Cabanatuan, Nueva Ecija, Philippines, had to undergo for so many years. Whenever the local river system would overflow, the said car dealership would be under the threat of inundation. 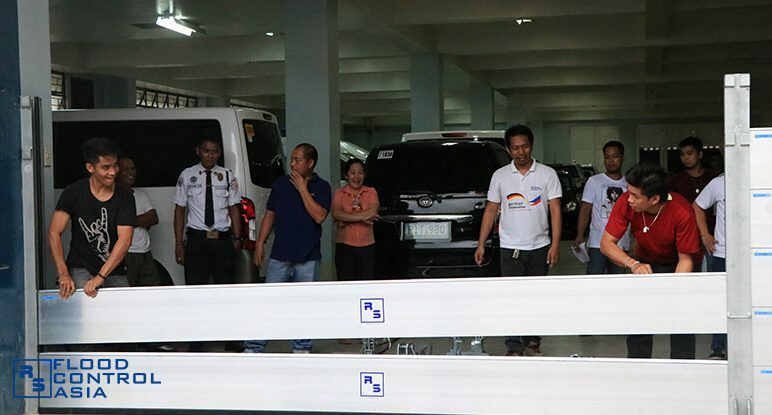 All of its trades, including the million-peso brand new cars, would have to be evacuated for safety. 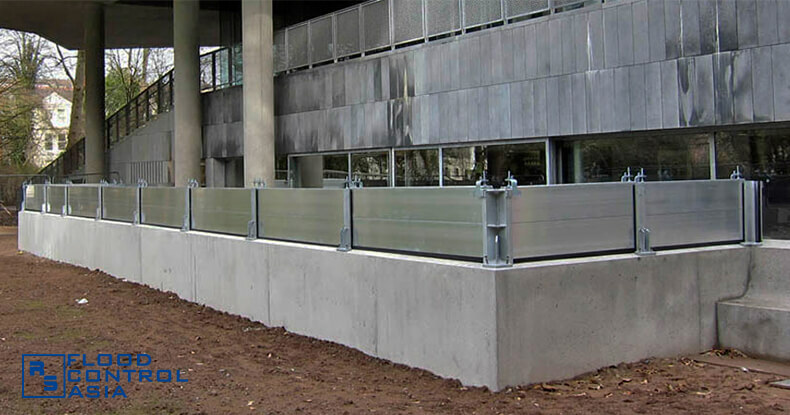 Flood Control Asia RS Installed Successfully. Royce Motor is located in Maharlika Highway, Cabanatuan City. The said city sits in the central part of the Nueva Ecija Province, considered as the rice granary of the Philippines. Although the province of Nueva Ecija is a sprawling plain dominated by rice paddies, it has never been safe from flooding. During the Philippine monsoon season, the Sierra Madre mountain range that borders the province on the right accumulates rainwater. This volume of rainwater cascades down the slopes of the mountain and floods the province of Nueva Ecija. 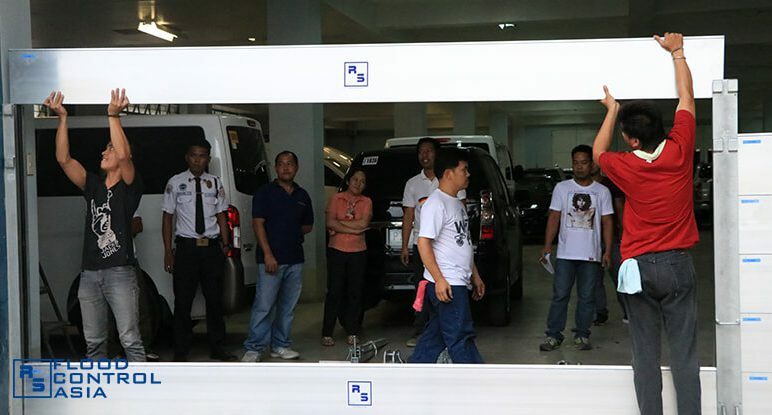 As mentioned above, Royce Motor faced immense flooding threat due to the disadvantaged position of Cabanatuan City. 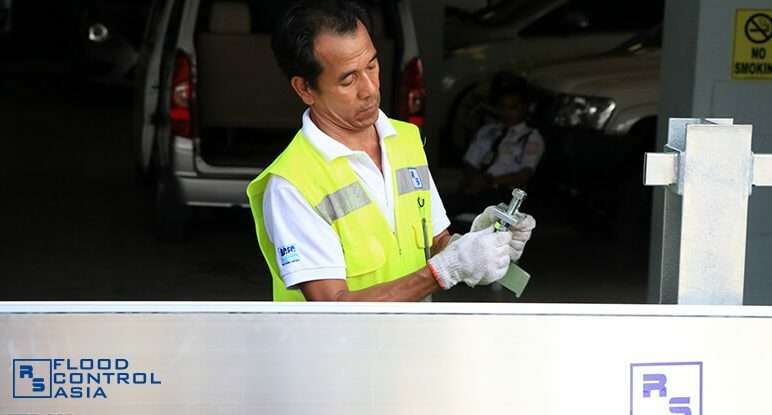 Aside from it, being a catch-basin of the Sierra Madre mountain range, Cabanatuan City has some faulty public works that worsen flooding incidents. The road constructions along Maharlika Highway affects the draining of floodwater from the major thoroughfares. Also, the existing drainage facilities in the said area was insufficient, as monsoon rains had a tendency to pour above-average volume of rainwater. 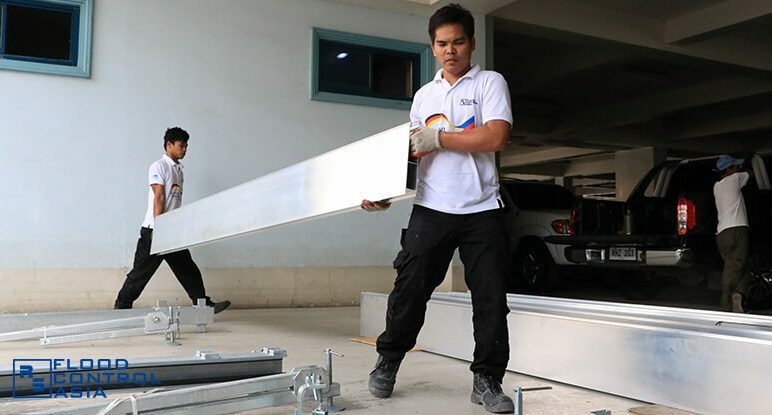 The owner of Royce Motors said the annual flooding in Nueva Ecija plagued their business for so many years. 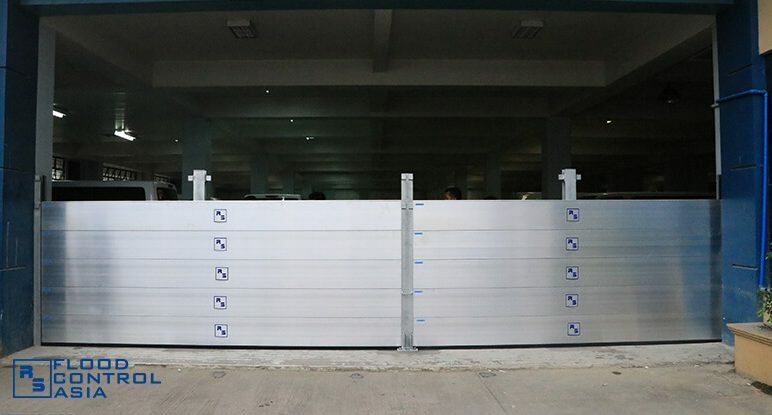 In the recent onslaught of Typhoon Lando (known internationally as Koppu) in 2015, Royce Motor suffered from the destruction of two brand new cars, which were submerged in floodwaters. 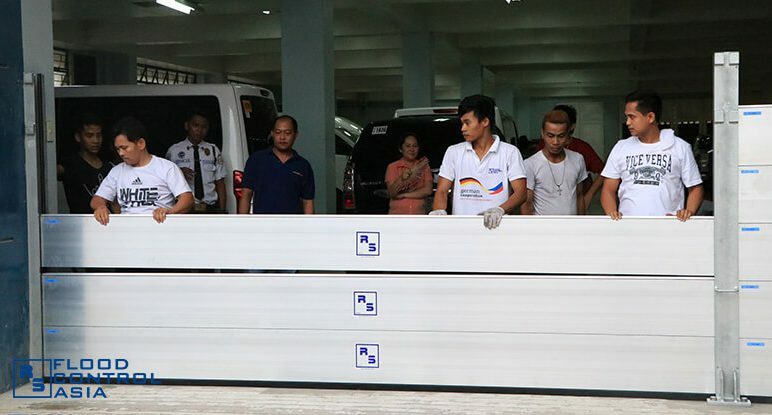 The rest of the items displayed in the showroom (or stored in the warehouse) was evacuated to a nearby parking lot owned by a popular mall in the Philippines. 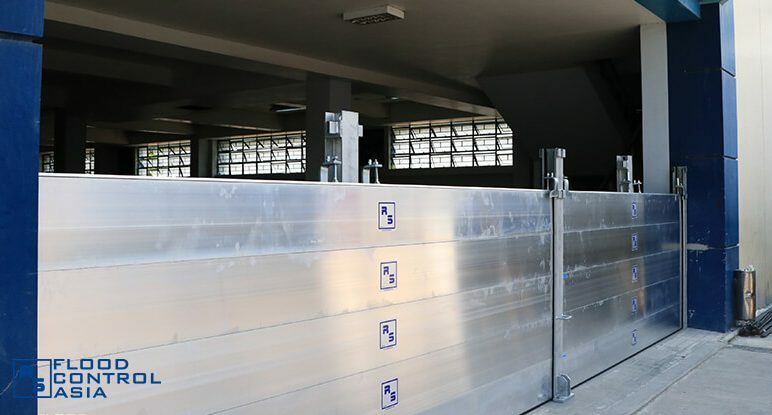 Since the parking lot was not a public domain, Royce Motors had to pay for the car’s occupied places. The cars were temporarily parked there for a month while repairs in the car shop were on going. Needless to say, the extensive facility renovation was coupled with the need to replace damaged sets of office equipment. 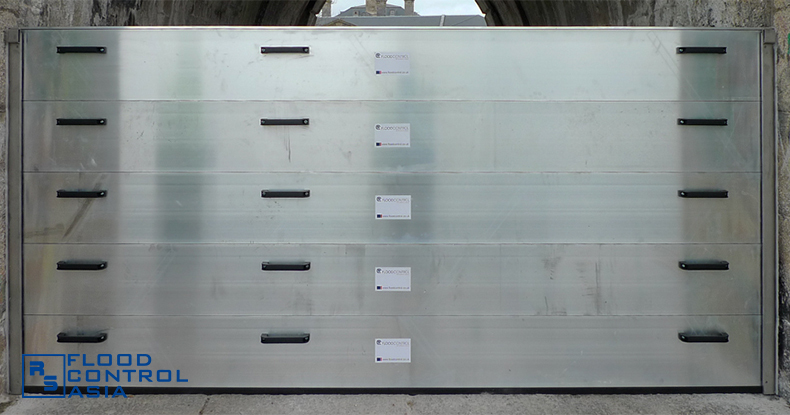 Generators were likewise affected, and a company warehouse needed refurbishing. 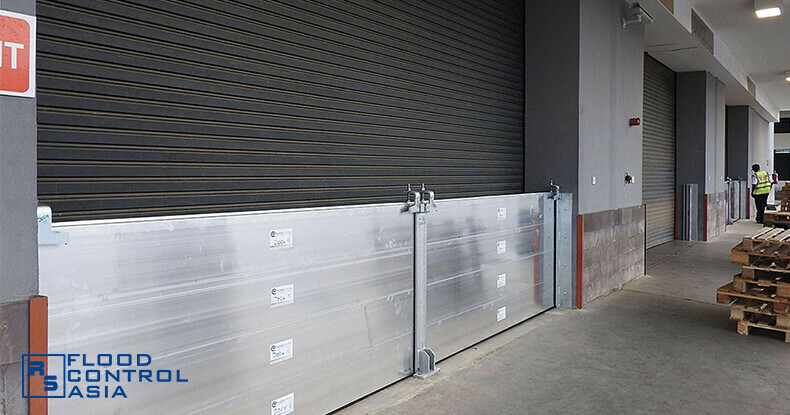 In the previous years, Royce Motor relied on sandbags as temporary protection against flooding. Then, they turned to bags filled with gels, but even the latter option was not effective. Instead, these were alternatives that were all costly and would require intense effort to prepare. 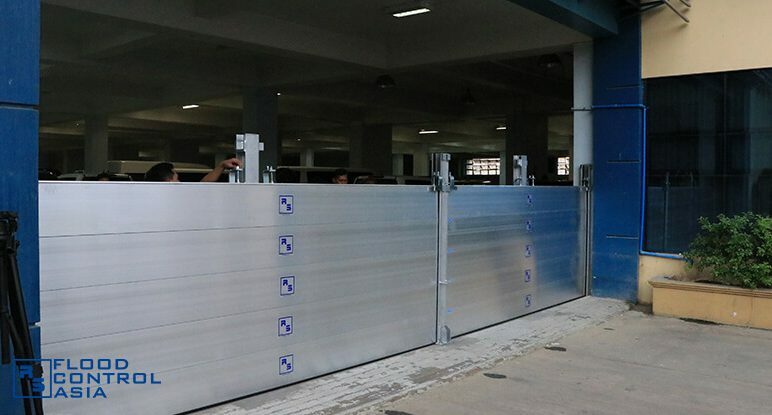 Beset by this overwhelming flooding problems, Royce Motors turned to Flood Control Asia RS, Corporation (FCA). 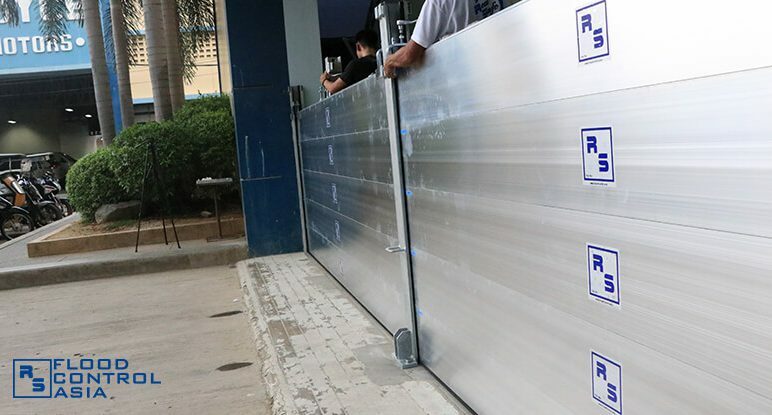 FCA targeted the total protection of all brand new cars displayed in Royce Motor’s showroom while maintaining an unhampered access to the building. 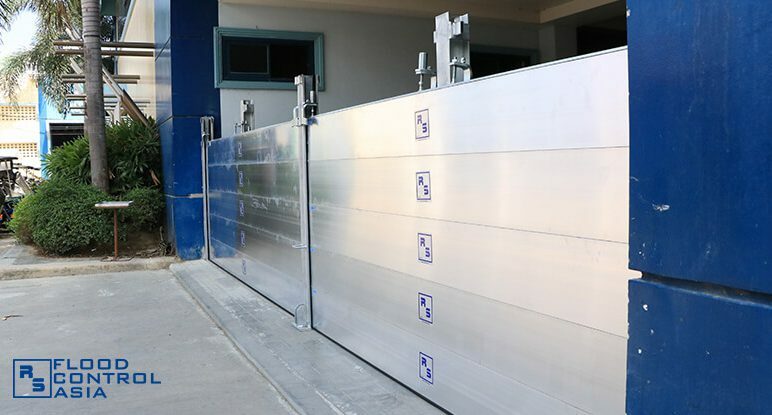 FCA’s engineers prescribed RS Demountable Flood Barriers as a flood control solution for Royce Motor. The maximum estimated floodwater depth was pegged at 1.50 meters, but an allowance was provided as a safety measure. 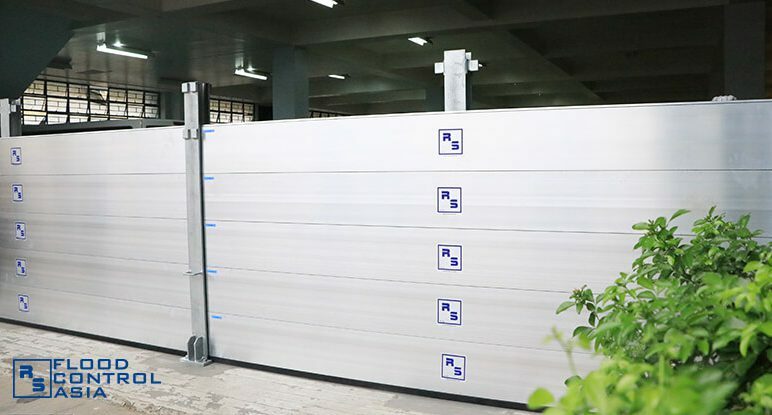 Aside from the complete set of RS Demountable Flood Barriers, Royce Motor also availed of RS Drain Plugs to avoid instances of back flows from obscure entry points (e.g., toilets and floor drains). 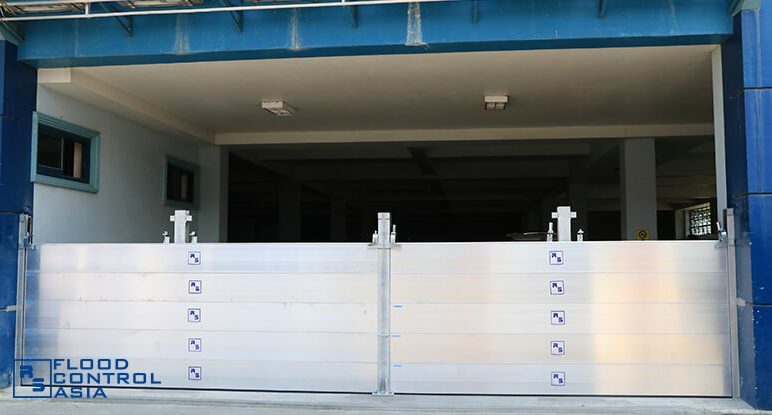 Royce Motor is a car dealership located in Central Luzon, Philippines. The said car shop frequently experiences flooding, which puts the entire business at risk. The almost annual flooding was caused by the monsoon rain season that occurs every year in the Philippines. The city where Royce Motor is located is on a catch-basin, where the accumulated rainwater from Sierra Madre mountain ranges flows. 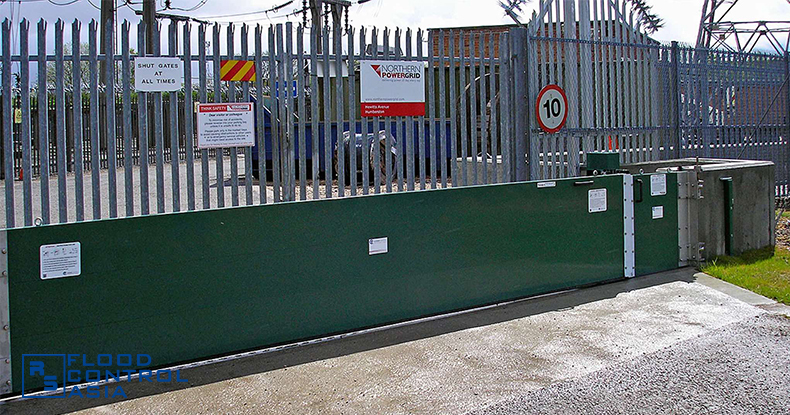 The drainage facilities around the car shop is insufficient to control the flow of floodwater. 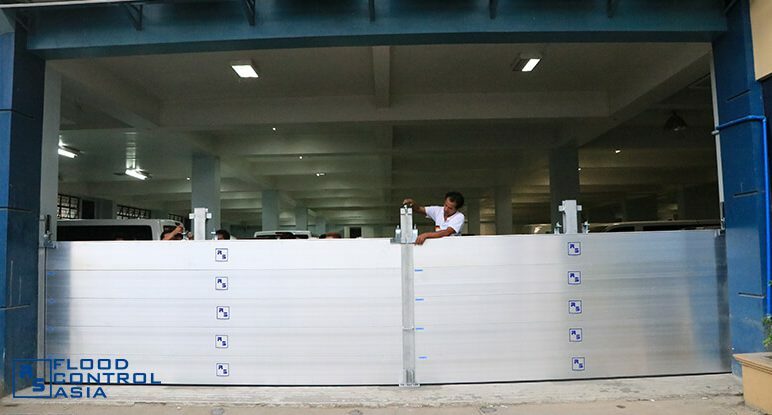 The immediate community is flooded; hence, the need to protect the car shop from floodwater. Two brand new cars were damaged by flood. Sets of office equipment were also affected, and official documents were destroyed. Electronic sets, including computers and printers, were submerged in floodwater. 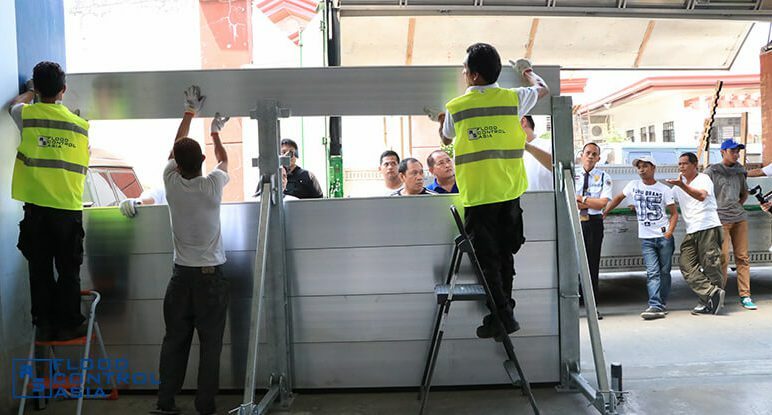 Even the back-up power generator system was affected by flooding. Heavy rainfall that occured in July 2017 caused flash floods in the community. 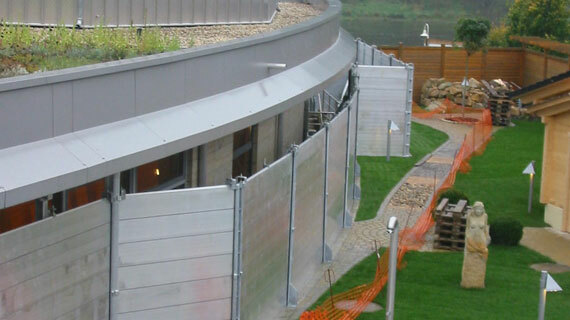 The company crew quickly assembled the flood barriers, and the whole building was protected from flooding.